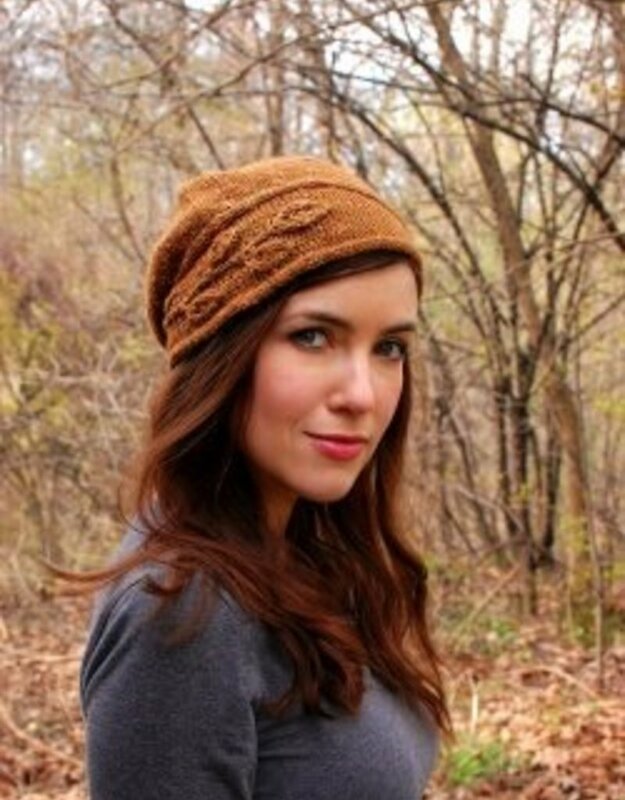 Inspired by the Sprig pullover from my latest book, Botanical Knits 2, the Sprig Cloche is a face framing hat design with a sprig of foliage gracefully wrapping around the asymmetrical brim. The brim is first knit flat, then stitched together at the ends. Stitches are picked up along one side and knit up in the round to create the body of the hat. Size Women's Medium-Large (fits 20 - 22" / 50-60 cm head circumference) Finished Measurements Brim Circumference: approx 20" / 50 cm unstretched Materials The Fibre Company Acadia [60% merino wool, 20% baby alpaca, 20% silk; 145 yd / 133 m per 1.75 oz / 50 g skein]; color Amber; 2 skeins or approx 225 yd / 200 m of a dk weight wool or wool blend. Alternate Yarns: Elsebeth Lavold Silky Wool, Rowan Felted Tweed DK Gauge 21 sts / 30 rows = 4" / 10 cm in Stockinette stitch worked in the rnd on US6 / 4 mm needles or size needed for accurate gauge.